BALTIMORE (CNS) — Seven Catholics and four Pentecostals met in Baltimore to focus on understanding their commonalities and differences. The 11 church leaders attended the third session of the sixth phase of the international Catholic-Pentecostal dialogue, which began with Mass July 14 at the Basilica of the National Shrine of the Assumption of the Blessed Virgin Mary in Baltimore. Discussions were to continue through July 19 at St. Mary’s Seminary and University. 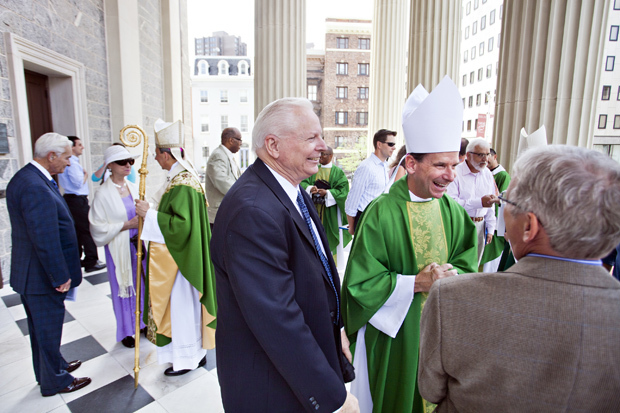 Bishop Michael F. Burbidge of Raleigh, N.C., gave the homily at the July 14 Mass. The dialogue, which began in 1972, brings together the Pentecostal Church and the Vatican-sponsored Pontifical Council for Promoting Christian Unity. The theme of the session was about healing: how spiritual healing takes place within our lives and what are the Pentecostal and Catholic understandings of healing, Bishop Burbidge said. Discussions began July 14 after participants listened to two reports on papers about healing — one from a Catholic, another from a Pentecostal. “We share a deep commitment to Jesus Christ,” said Cecil M. Robeck Jr., Pentecostal co-chairman of the dialogue, professor of church history and ecumenics and director of the David du Plessis Center for Christian Spirituality School of Theology at Fuller Theological Seminary in Pasadena, Calif.
Lowe is a reporter for The Catholic Review, newspaper of the Baltimore Archdiocese.